Everything you need to extend our Recessed PVC column by 12". This extension kits includes: one set of PVC recessed panel dividers, astragal trim to hide the seam as shown in the drawing and a 12" section of column shaft that matches your column perfectly. 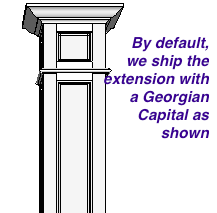 We typically replace the standard box cap with a four piece Georgian capital as shown on the first drawing. 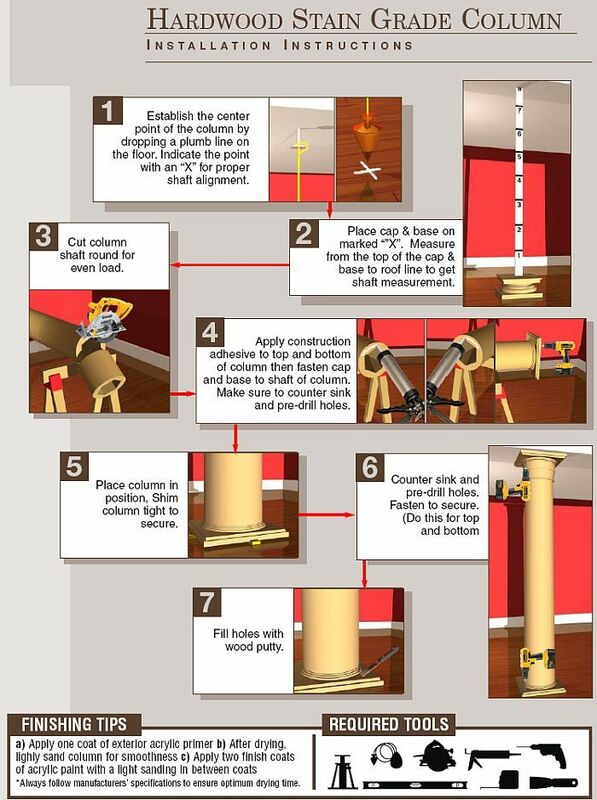 Find helpful tips, specifications and installation advice on how to install our columns. Read through the instructions to see if this is the right product for you. Made specifically for easy UPS or Parcel Shipping, an amazing feature, as Parcel Shippers do not accept packages longer than 8 feet, this one-foot extension is the perfect alternative. Today's new homes have nine-foot ceilings making this extension a popular product for us. This comes flat packed with a mitered edge for easy glue assembly. 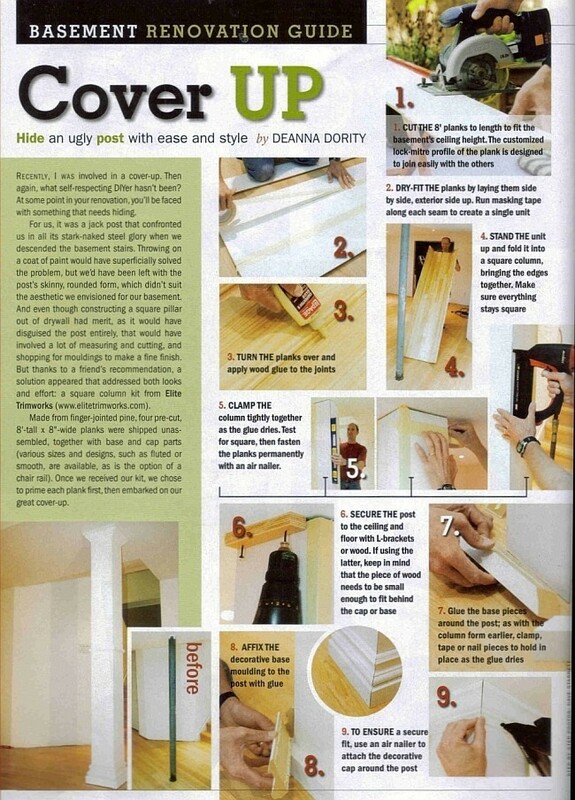 You will have enough glue and tape from the column cover to complete the installation. The extension is 12” high and matches the thickness and outside dimensions of the column shaft ordered. The extension or the main shaft can easily be cut down on site to suit using a chop saw. Available for our 8 or 10 inch PVC Columns. Larger 12" by 8ft columns are too big to Parcel ship making this extension kits redundant. Included with the column order. Elite Trimworks does produce most of our interior columns and most exterior columns. We specialize in manufacturing PVC Columns. Are your columns load bearing? Yes, all of our round wood and Fiber Cast columns are load bearing. 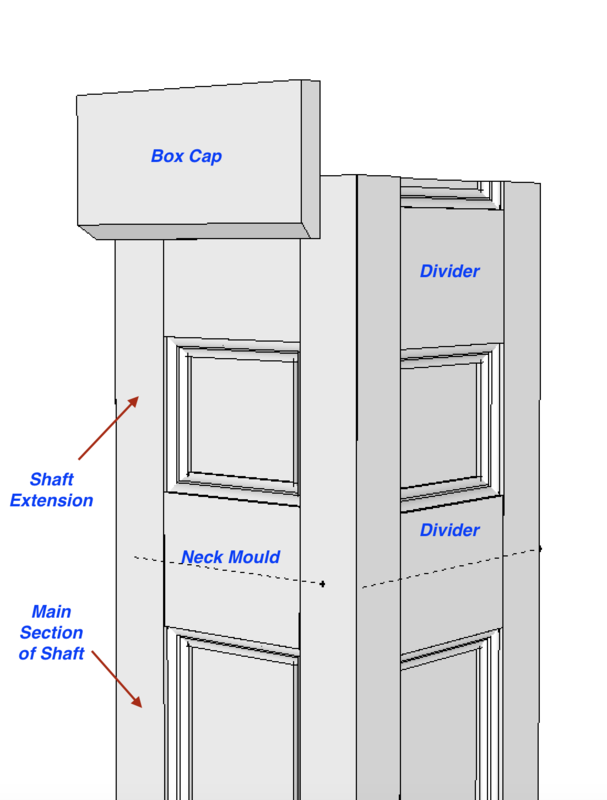 Refer to website for the load bearing capability of the desired column. If my wood columns are split, what type of adhesive do I need to reassemble them? To reassemble a split column, a high quality wood glue adhesive should be used. This product can be found at any hardware or construction-supply provider. How do I secure a split column to a wooden or metal post? 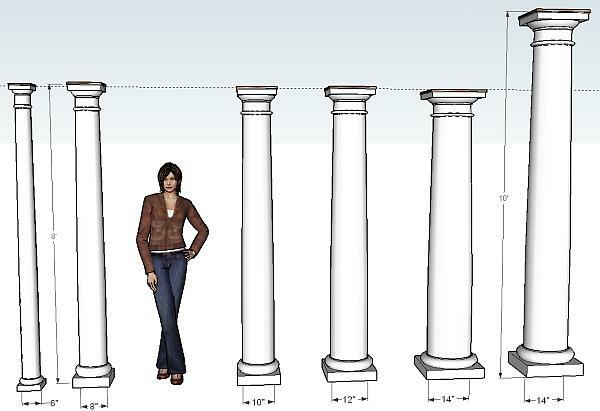 Depending on your application, there are several ways to hold a column in place when used for decoration purposes only. 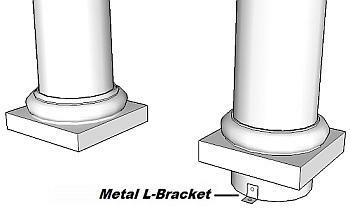 One of the most common ways to hold a column in place is to use standard "L" brackets on the bottom and top of the column's shaft. The Tuscan Base and Capital hide this method of installation. If being assembled around a wooden post, a common way to secure the column is by using wood shims. The shims should fit snugly between the column shaft and the post for proper stability. 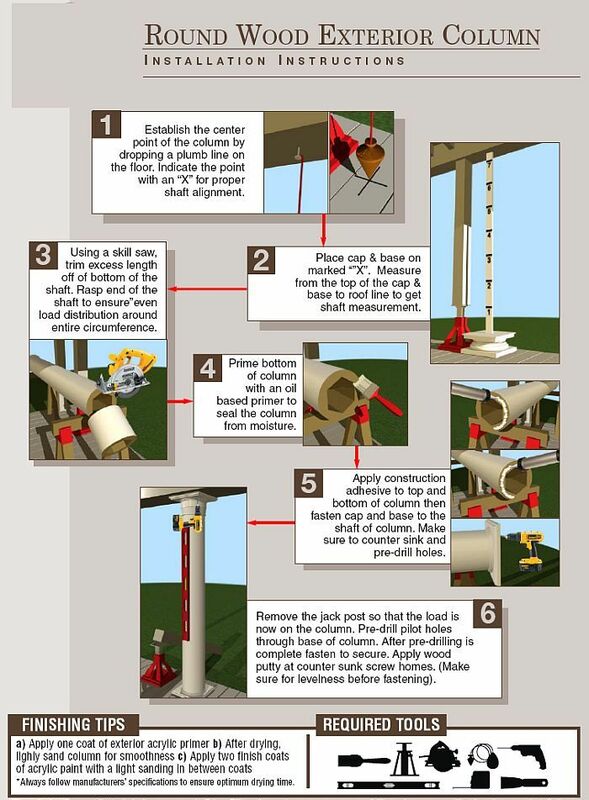 Be sure to visit our website for further column installation instructions. Can I trim my columns to a lower height? Yes. 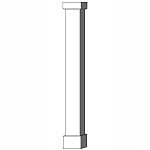 If it is a non-tapered column, 1/3 of the shaft height can be trimmed without affecting the fit of the base and capital. Trimming must take place from the bottom of the shaft only! How are the columns shipped? 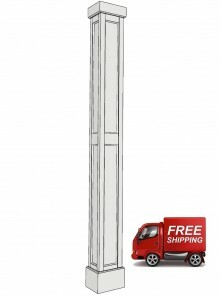 Columns measuring up to 8 feet are shipped using UPS. Any column longer than 8 feet must be shipped using a common carrier (Tractor Trailer) and different shipping rates apply. What happens if my columns arrive damaged?  Is Elite Trimworks competitive with their pricing? You bet ya! Our 20,000 square foot warehouse allows us to buy in volumes. Half of the columns we sell are made in-house and we pass on the savings to you. We are confident that our prices are some of the best out there. Give us a call and find out for your self. 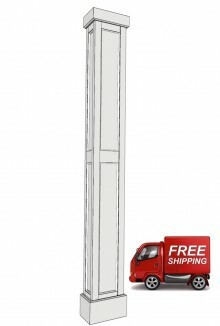 Can I install the columns myself or will I need a contractor? Columns less than 9 feet are easy to manage for proper installation if you are handy with basic tools required. Our website has downloadable instructions for installation. Columns over 9 feet high are best managed with the assistance of an experienced contractor. Can columns go around poles and beams? Any column is capable of being split in order to accommodate your design. The rules are as follows: Round Beams take overall diameter; Square Beams, take diagonal measurement from top to determine width. Refer to our specs for inside clearance of the shaft to determine proper size column needed. Do capital and base add any height to the column? 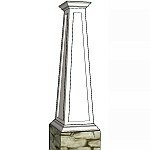 When you order a round wood column the capital and base are factored into the overall finished height of the column. 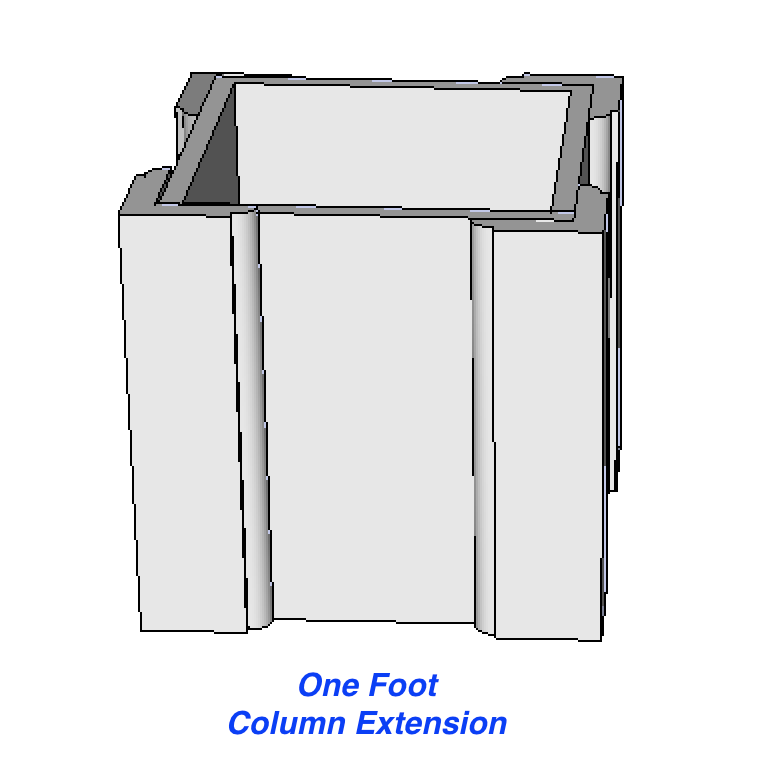 When ordering the Fiber Cast columns, the capital and base are pieces that fit around the column (see image below) and so they do not play a part in adding height to the finished column. Are the capitals load bearing? 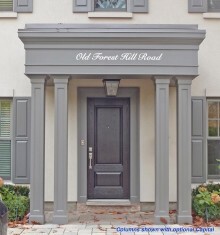 Decorative capitals are strictly for decorative purposes and are not load bearing. 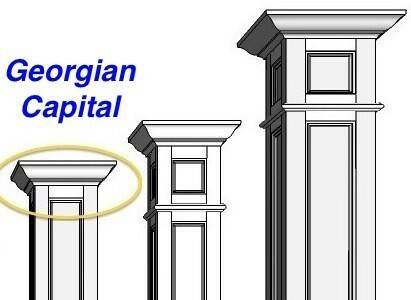 The wood or MDF capitals that come standard with the wooden columns are load bearing. 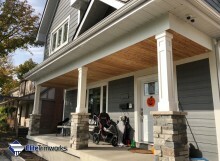 Are your exterior columns insect and decay resistant? 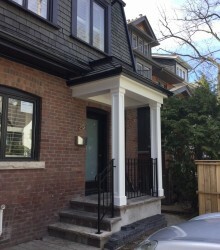 All our exterior columns are engineered and tested to warrant against damage caused by exterior elements. How are the columns approved for load? All of our columns come with full strength and material testing provided from our local material testing facility and engineer, see individual products for exact load bearing data. How wide should the column shaft be? How should I paint my interior columns? Bulls Eye 1-2-3®i (see site for complete details) a whole house, universal interior/exterior, water-base stain-killing primer-sealer. Excellent adhesion to glossy surfaces, including tile and enamelled trim. Low odour and easy-to-apply with great flow and levelling. Breathable, flexible acrylic formula resists blistering and peeling. This primer generally dries and is ready to expect paint within the hour. Why should I discuss my project with you? Speaking with us will ensure that you are getting the correct column for the job, our years of experience may prevent you from making costly errors. © 2003 - 2019 Elite Trimworks. All rights reserved.